Did you know that bloggers are actual people? We are. Shocking, I know. Although a few of us in the DIY blog world come from a career in carpentry or construction, most of us were everyday Joes like you. I die a little inside every time I read a comment about one of my projects saying something like "I love this, but it looks too hard." or "I wish". Guess what guys? There was a time in my life when I didn't know how to weld, or even drill a pocket hole. That stuff can all be learned. Don't think just because you don't have the experience, you can't create beautiful things. Clark Kent worked in a newsroom by day, but just remember what he did at night! I have some pretty inspirational friends. I talked to 13 of my DIY blog besties, and asked them to share what was their "real job" before becoming a blogger. Take a look. I'm sure you'll recognize some of these names, and I bet their answers will surprise you. Greeting Card Artist, Illustrator, Graphic Designer and Web Designer. No formal training, just the belief that I could do anything I put my mind to!" Mindi from My Love 2 Create: "Physical Education and Dance teacher, and a mom. smile emoticonI started because I wanted to learn so just jumped in with a project...the rest was history." Brooke from All Things Thrifty: " I taught Communications classes mostly Comm 1010, Intro to Advertising, and Public Speaking." Sarah from The Ugly Duckling House: "I used to work in software & still work in media. I started DIYing because I bought a fixer-upper that needed way more fixing than I anticipated, and I was way too stubborn to call in a pro." Kim from The Kim Six Fix: "I was a cell biologist. I worked in research studying the effects of preeclampsia on pregnancy. You couldn't get a more "left brain" profession than 'scientist.' Working with my hands finally gave me the chance to use the right side of my brain in new and creative ways." Bethany From Sawdust and Embryos: "I worked in the business office at a health clinic... I get emails DAILY from people saying something like 'looove your work, but I could never do that'. Well, you're in luck because I just tediously photographed every step and explained in great detail so you could do it too! Amy from Her Toolbelt: "I was a Mechanical Engineer that tested rockets"
Jacque from The DIY Village: "I was a pre-school teacher, and am currently an office manager. We DIY because that's what we can afford, plus it's a pretty awesome sense if accomplishment." Katie from Addicted 2 DIY: "I was a firefighter/paramedic and I left that career when my husband (also a firefighter/paramedic) and I got married. I DIY because (a) we live off of my husband's income and firefighting doesn't exactly afford us the luxury of shopping at Pottery Barn; and (b) because my husband absolutely refused to pay $500-$1000 for an entry table for our house. I decided that if he wasn't going to let me buy things, then we would build them." Jessica from Decor Adventures: "I was/am a higher education administrator, so I coordinated large scale special events, did marketing and communications for the university. " Karah from The Space Between: "I worked in the hospitality industry with a degree in International Hotel and Tourism Management." Kit from DIYdiva: "I'm the Director of Operations for a consulting firm. I build and blog in my spare time because I love it (plus, I like having an excuse to buy more power tools.) Before buying my first house 11 years ago, I did a lot of "art projects" and refinished furniture... took just a few years for that to escalate into a contractors license and building my own house addition a while back." Donna from Funky Junk Interiors: "My first job was weeding in a greenhouse field. Then I worked a gas station. Then department store. Then professional signmaker. Now I make faux signs but they are MUCH cooler. Jen from The House of Wood: "I was/am a songwriter. Nothing to do with woodworking! Unless you count playing a guitar "handling wood." Ha!" I am a licenced cosmetologist. I went to school to learn how to cut hair, not wood. I originally started building to save money. Now I build to save my sanity. I love being able to express my creativity in a piece of furniture that we use everyday. There is so much gratification in creating something from nothing, and knowing I did it with my own two hands. ANYONE can learn to build and create. Don't ever think just because you aren't "handy" today, that you can't become one hell of a DIYer down the road. Ladies, now I'm talking to you. Don't wait for your man to take that plumbing class at Home Depot. Get some education, then get your hands dirty! We can be awesome too! Feeling apprehensive? Lucky for you, I have some pretty talented friends who along with myself are here to answer your questions. That's why our blogs exist. To show you how to make the impossible, possible, and to take the mystery out of DIY. Check out the links to the blogs above. Those ladies know what they're talking about! Please, feel free to if you ever have a question or need advice. Now, go build like a boss! All professionals - in various fields - interesting. I found this so interesting! So many cool and diverse "jobs". You can add audiologist for me to the mix. Say "what?" yep heard that one before and it never gets old! That was such a neat post idea. There are several bloggers on here that I would have never guessed what their past professions were. Thanks for sharing! This is such a neat idea for a post. 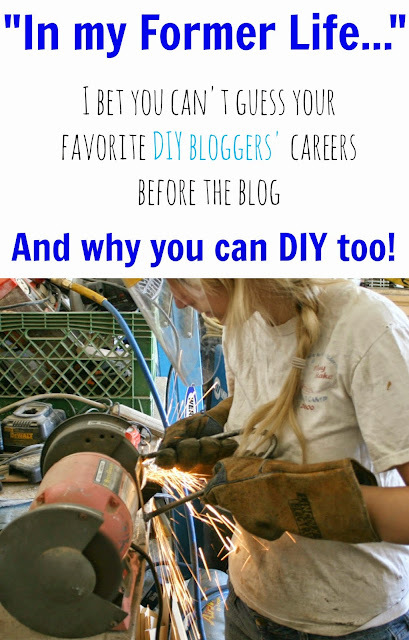 There are many bloggers on here that I would have never guessed their past professions. Thanks for sharing! So fun to read what everyone did in their "past" lives. Thanks!